Another little ‘B’, this time from Lippert Pictures, that should be added to a box set. Exciting opening as a car being chased by the police goes over a cliff. A fugitive and an assistant D.A. are killed. The only survivor is the attorney’s wife,Marian, played by Luana Walters. Russell Wade is a reporter who knew Marian and her late spouse, and he decides to investigate what happened. There are several flashbacks in the lead up to the car crash. The late lawyer was in cahoots with gangster Nestor Paiva ( with no accent, very unusual for this actor). It’s a good little thriller with a leading lady I liked but have never seen before,Luana Walters. Russell Wade made only two more films after this,one of which was Sundown Raiders (1948) in which his character’s name was Russ Wade. At 31, he changed careers and went into real estate. Columbia produced this B ( running just 60 minutes). It is quite raw in its story of under age girls being used as ‘hostesses’ in road side motels. Nan Grey and Mary Anderson play sisters,Jan and Edie who are being released from the County Detention Home for Minor Girls. A sleazy looking ‘Tap’ ( Alan Baxter) is waiting outside as several girls are released from the home. He offers them jobs as ‘hostesses and entertainers’ at a chain of motels along the highway called ‘The House by the side of the Road’ – a company run by ruthless business woman,Mrs Burke (Leona Maricle). Jan and Edie reluctantly accept the job offer,along with some of the other girls. One of their duties is to go out on the highway pretending to be hitch hikers,and get men to drive to the motels. Tom Neal is Rocky Stone (he’s a jeweller!) and Don Beddoe is his partner Albert. They are on the road and stop for Jan who brings them to the motel she is working at. While the older Jan hates what they are doing, Edie is enjoying herself, encouraging the men to drink and gamble. This was Nan Grey’s last film – she had a happy marriage to Frankie Laine. 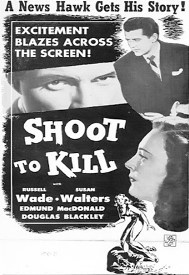 The film was directed by Edward Dmytryk. Shoot to Kill I know (and I agree it’s a goodie) but Under Age is new to me. I must start looking out for it. Glad you like Shoot to Kill. Hello! I am Desiree from Rozrussell.com. I am just checking out your blog here. 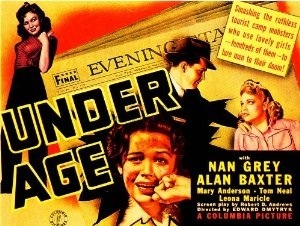 I really liked your post on these movies Shoot to Kill and Under Age. I have to admit I have never heard of either, but your post intrigues me. I will keep the titles in mind. Your site looks great. I love the style. Nice to hear from you. I love your Rosalind Russell blog. I’ve reviewed Night Must Fall and It Had to Happen.